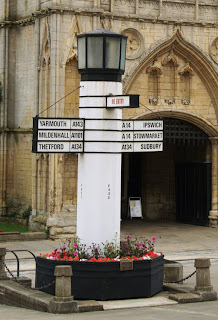 The first in an occasional series of interesting signposts, this fine example stands on Angel Hill in the centre of Bury St Edmunds. It was designed by the town council's architect, Basil Oliver, in 1935 and was probably the first internally-lighted road sign in the country. Such an extraordinary structure is all the more surprising when you consider that the Ministry of Transport granted special permission for this oddity, having issued regulations to standardise road signs only two years earlier. I didn't plan a visit here, but the sign to the Bakelite Museum in Williton, Somerset was irresistible. This private collection is housed in (indeed, crammed into) an old mill, and many of the displays are on open shelves. Some, like a tie press, even encourage you to touch. 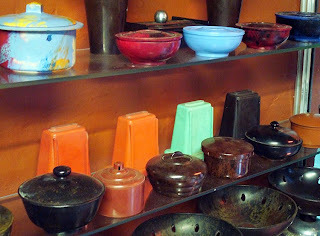 If a bakelite collection conjures up images of endless brown plastic, think again: bakelite essentially has two meanings. First, there's the dark material invented by Dr Leo Baekeland who gave his name to the product. The second, looser definition is any early twentieth-century plastic, and a lighter, coloured version had soon been invented so the museum is a rainbow of colours. Bakelite was the first synthetic version, using the petrol derivative phenol formaldehyde as a resin. 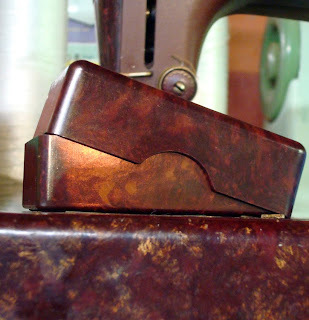 However, the colours of the resin and the wood filler mean that true bakelite has the dark colour we are familiar with. Only in the 1920s - fifteen or so years later - did other resins such as cast phenolic and urea formaldehyde produce lighter plastics. 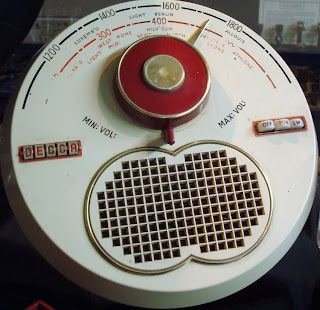 The museum is stuffed with twentieth-century plastics of all kinds, as well as rare nineteenth-century pieces. Much is unlabelled, but that all adds to the fun of discovery. Open easter to the end of September (daily in school holidays, Thursday to Sunday in termtime). This Palladian villa must be one of Lewisham's more surprising properties. Tucked away on Lewisham Way, its garden walls conceal a unique and rather grand eighteenth-century home. The Stone House was built by architect George Gibson as his own home. 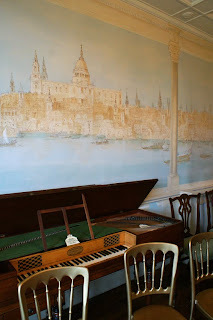 Other commissions had included work for Queen Caroline and Woodlands House, home of banker John Julius Angerstein. Freed here from the need to please clients, though, he produced a house sufficiently eccentric to spend many years under the name the Comical House. The name would change in the mid-nineteenth century, to the Stone House. Perhaps the (albeit radical) MPs who lived there for much of the Victorian period felt the less interesting name more dignified, given their public position. One of my favourite discoveries about this house was that it is actually an early example of stone cladding! The building is brick, with an outer skin of stone reputed to be from the old London Bridge. (Careful research by the current owners has established that the story might possibly be true, since material from two arches from the bridge was stored in south-east London at the time). 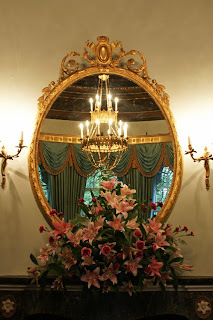 The house has been restored, and has impressive interiors perfect for eighteenth or twenty-first century entertaining. 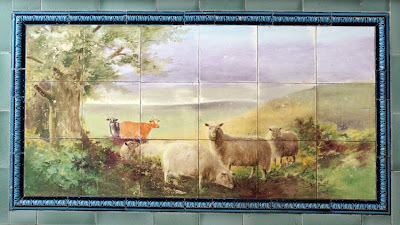 One very contemporary feature is the amazing mural in the dining room, painted by local artist Peter Kent. It shows scenes of the river Thames from Westminster to Greenwich; one of the boats includes the artist himself and flies a flag reading 'PK 1995'. The grounds include water gardens and rolling lawns. They may have shrunk considerably from the original six acres, but remain another extraordinary feature to find in the heart of Lewisham. 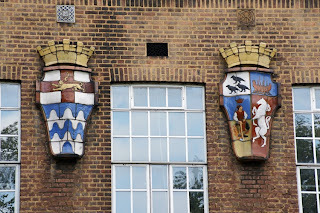 Although a London borough in its own right until 1965, Deptford didn't have an official coat of arms. That meant it was in the happy position of being able to create its own, albeit unofficial, version. 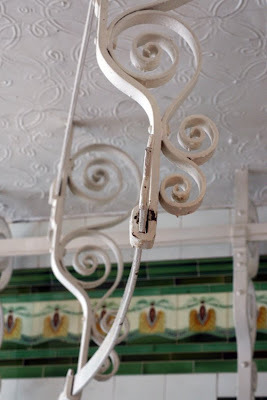 It's unusually lively and decorative, and each part makes a reference to local history. One imagines the council having great fun with the design! Beginning with the shield, the first (top left) quarter contains three Cornish choughs. These represent Surrey, one of the two counties of which Deptford was part - they appeared on the arms of the Earls of Onslow, major landowners in the county. That dockyard theme continues with the third quarter: the figure is Peter the Great, the Russian Tsar who visited Deptford to learn about shipbuilding. He is therefore depicted leaning on a log and holding a shipwright's adze. (This is a more dignified alternative to depicting him riding a wheelbarrow through John Evelyn's holly hedge!) I rather like the quirky floating crown above his head. The fourth quarter returns to the county theme: this time, the white horse is taken from the county arms of Kent. It reappears on the Borough of Lewisham's arms, but as a supporter. Finally, the crown on top - which should be made of brick - is a reference to municipal governance. 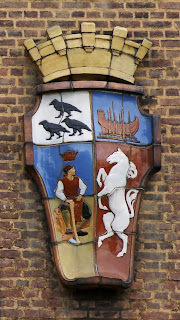 In other contexts, the coat of arms also had a background of heraldic dolphins and tridents, again emphasising Deptford's maritime connections. The dolphins have been included in the arms of the modern borough of Lewisham, too. Further reading: for information about this and other municipal coats of arms, see Civic Heraldry and Heraldry of the World. This college building stands on Lewisham Way, and it's easy to let your eye skim over the fairly unexciting brick shape. However, if you pause to look more closely, there is some interesting detail to be seen. 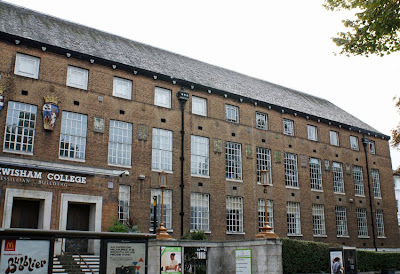 The Tressillian Building was built 1927-31 by Frederick Robert Hiorns and George Topham Forrest, as SELTEC (South East London Technical College). Hiorns, author of Town Building in History, and Forrest, also responsible for Lambeth Bridge, were both employed by the LCC Architects' Department. Pevsner approves of their work here: it is 'quite impressive as an unrelieved twenty-three-bay brick block ... The sort of effect the Danes sometimes obtained more self-consciously.' 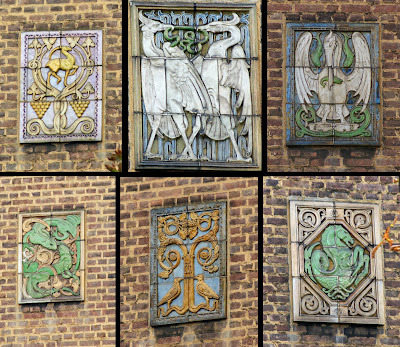 However, he makes no mention of the decoration on its facade: perhaps the tiles were added later? Skating rink mania - noise nuisance from a Victorian brass band. New Cross evacuees - swapping south-east London for Sussex. A lovely old postcard of Broadway Theatre, New Cross and a Victorian paper bag from Brockley Fruit and Vegetable Market. Notable local residents Rowland Hilder - an American artist who spent part of his youth in New Cross - and R F Delderfield, New Cross-born novelist. 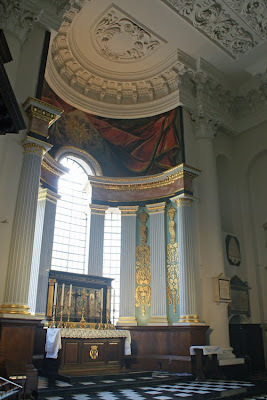 My first visit on Sunday was to St Paul's on Deptford High Street. One of Queen Anne's 'fifty new churches' (only about a dozen were actually built), it's a stunning piece of baroque architecture. Deptford had grown drastically by the early eighteenth century, largely thanks to the dockyard. The little parish church of St Nicholas no longer seemed adequate, so St Paul's was constructed between 1712 and 1723. Among the craftsmen working on it was Thomas Lucas who would also build homes in nearby Albury Street. 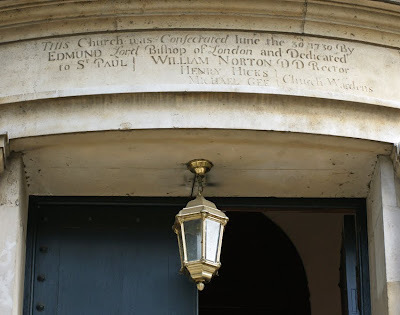 Once completed, the new parish church faced a further battle to get income: unsurprisingly, St Nicholas wasn't keen to give up any of its tithes to a fancy younger sibling. Eventually Parliament stepped in, and the church was finally consecrated only in 1730. The new church must have impressed its parishioners, because the interior is stunning. 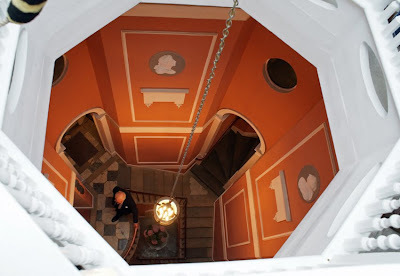 We now see it in its full eighteenth-century glory, thanks to restoration and a lucky fire. The small blaze at the eastern (altar) end of the church revealed the original decoration, which has now been fully restored. Further back in the nave, there have been changes: the original box pews were replaced by Benjamin Ffinch, the rector, in 1859. 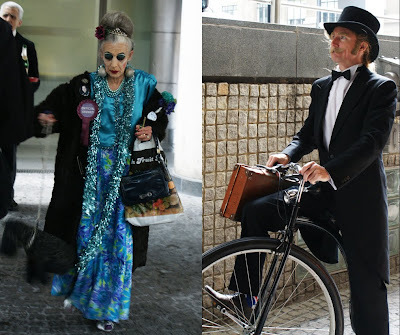 However, while the Victorians were notorious for (often inappropriately) favouring fashion when making such changes, Ffinch chose a more harmonious approach. He even reused the original wood, adding pitch pine imported through Surrey Docks for the seats. 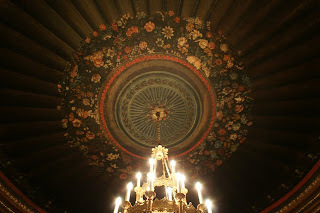 Perhaps the most noticeable addition, though, is the chandelier. 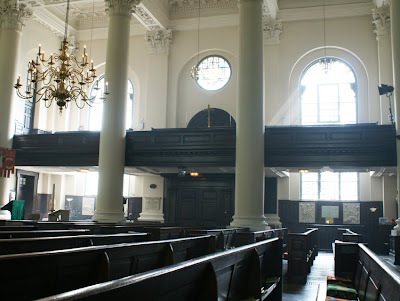 This grand light fits in beautifully, but actually came from a London theatre (Nicholas Taylor, author of the guide to the church, suggests it was the Scala in Charlotte Street). If you'd like to see the interior pre-restoration, Transpontine has featured UB40's 1983 video for Many Rivers to Cross, filmed in the church. 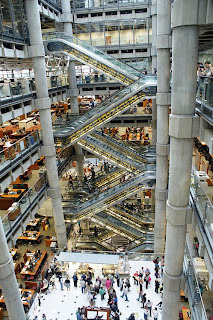 From one extreme to another in an afternoon: as well as the small, quirky and nearly unknown W Plumb Family Butcher, I visited the Lloyds Building. This structure is huge, famous and had a half-hour queue curling round it. Luckily, there were some performers to help the time pass quickly. The building is home to Lloyds - the insurers, not the bank. Here, syndicates agree to insure all sorts of risks. The institution began with informal meetings between shipowners and underwriters in Edward Lloyd's coffee shop over 300 years ago, but today is the world's largest insurance market. 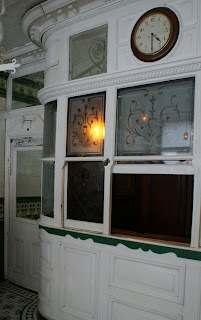 It moved to its current premises in 1986, but has kept various pieces of the past. 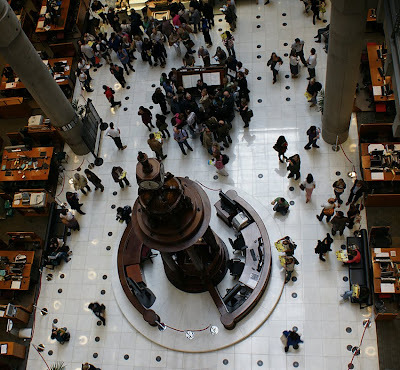 Visitors first see the Room (the underwriting room) on the ground floor. Here are the Lutine Bell, which used to ring announcing news of ships overdue at port (one ring for bad news, two for good), and the losses books which record ships lost at sea. 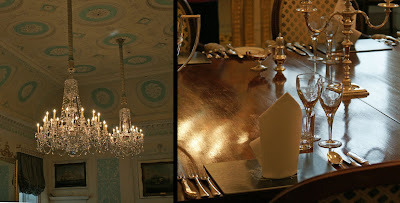 Up on the 11th floor is the most extraordinary survival: an eighteenth century dining room designed by Robert Adam. 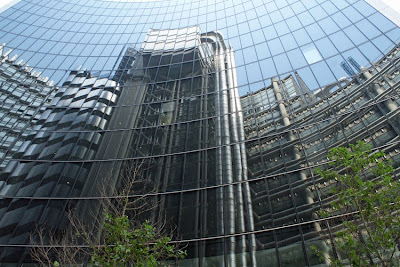 It was bought at auction in 1958, and moved from the previous Lloyds building to this one thirty years later. The dining room is impressive in its own right, but all the more extraordinary for its location high within this postmodern office block. The eleventh floor was reached by the famous lifts: like most utilities (including conduits for electricity and water), they are located on the outside of the building. This unusual arrangement is intended to maximise space, as well as make the lifts more readily accessible for maintenance As a bonus, it also means a chance to enjoy views across London as you travel, which must be ideal for busy City workers! Within the internal atrium, the workings of the escalators are similarly exposed. The design is thus reminiscent of its architect Richard Rogers' earlier work on the Pompidou Centre in Paris. 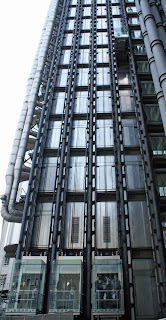 However, where the functions of the various ducts, pipes and so on are colour-coded on that building, Lloyds is monochrome, suggesting a more serious personality for the serious business of insurance. This small property was relatively off the beaten track for Open House, and the other side of London to my usual haunts, but offered the bonus of nostalgia since I used to live nearby. 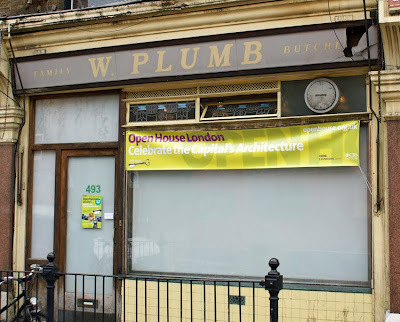 W Plumb was a butchers' shop from the beginning of last century until it closed in 1996 and was left with decor largely intact. As a result, it is now Grade II listed and recognised by English Heritage as a 'rare survival'. The original owners, the Nolden family (it only became W Plumb after the Second World War) must have been really proud of their shop. With its fancy floor and elaborate cash desk, this is far from the antiseptic white butcher's shop you might expect. 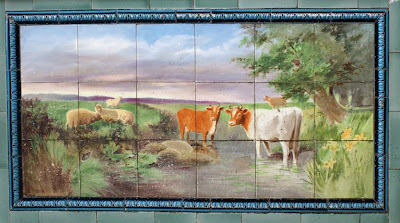 Other features include the original tiling - the highlights are two appropriately agricultural scenes - lincrusta ceiling and ornate meat rails. Shopping here must have felt like an occasion; unfortunately, the heyday of such independent stores was well and truly over by the time this shop finally closed its doors. 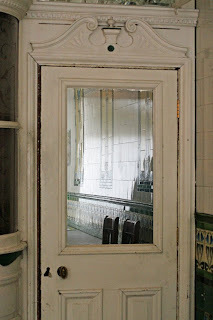 W Plumb may no longer be a family butcher, but it really is a hidden jewel on Hornsey Road. 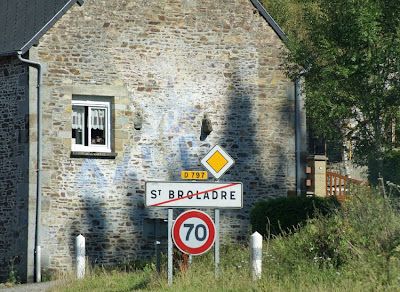 It marks the border between Normandy and Brittany, and is one of France's most popular tourist attractions. 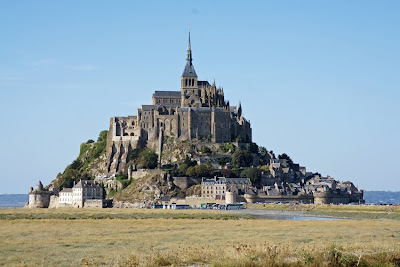 There's been a monastery here since the eighth century, it inspired St Michael's Mount in Cornwall, and (at least when not too crowded) it remains an extraordinary and atmospheric place. Mont St Michel is pretty special. 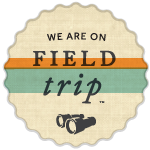 However, it's always been a place of pilgrimage too - and pilgrims, whether of the religious or tourist variety, want souvenirs. The road up to the abbey has been lined with sellers throughout its history, but over the past millennium tastes have kept changing. 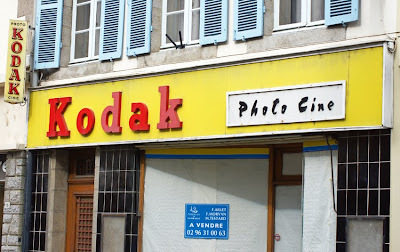 Today, as newspaper Ouest France recently revealed, the most popular souvenir in the Mont's shops isn't a local speciality. It's the plastic snow globe. From the seventeenth century, Britain punished large numbers of criminals by sentencing them to transportation. The Transportation Act of 1718 formalised this practice, and it was seen as a good alternative to hanging since long prison sentences had not yet become part of the penal system. Transportees would be sent to a colony to work, and would have to stay there for a set period - usually between seven years and life. However, with no return ticket, they often had little choice but to stay even after their sentence was complete. As for anyone tempted to return early, they faced the death penalty if caught. Mr Forward's Ship the Caesar is now taking in her Cargo of Felons at Deptford, in order to carry them to the Plantations in America, she being speedily to sail for that Part of the World. 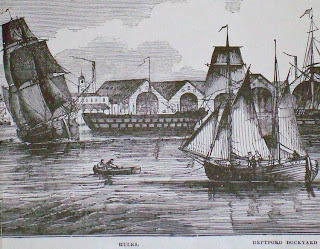 Deptford would continue to play a part in this penal process after 1775, when transportation stopped for a decade and convicts were instead confined to hulks (old ships with their rigging removed) in the Thames here. The hulks did not disappear, however, when transportation to Australia resumed. Instead, they continued to serve as overflow prisons and as temporary accommodation for those awaiting transportation. Indeed, they were used for eighty years despite growing protests at their appalling conditions: insanitary and overcrowded, they held prisoners who were chained up at night and forced to work on the river and docks (often still chained) during the day. Under such conditions, diseases including typhus and dysentry spread rapidly and mortality rates on the hulks could be as high as 30%. The hulks were finally abolished in 1857. They are one aspect of the river's heritage which no one can have been sorry to lose. 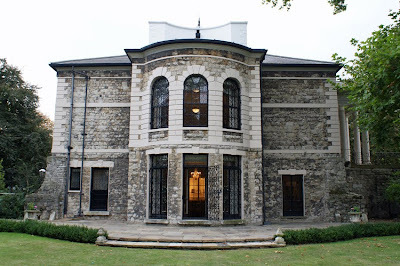 This weekend is Open House London, and there are a few local treats on offer in SE8. They include St Paul's, right on the High Street and billed as 'England's finest baroque church'. The church - or at least its rates - even inspired poetry! 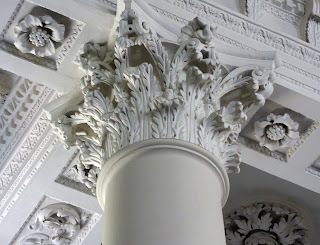 History and art are combined at Lewisham Arthouse, the former Deptford Library. This Edwardian building, an early public library, is now home to an artists' co-operative. 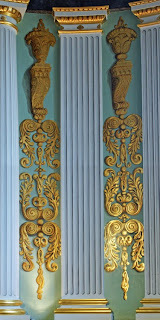 Consider it two for the price of one: original features and working artists, all in one visit. APT offers a similar combination, as this gallery is housed in a former rag-sorting warehouse. 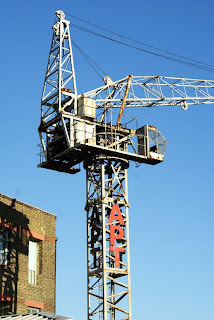 Look out for the crane outside. Finally in SE8, there's another blend of old and new: 2 Ashmead Mews, where architect Dominic Weil adapted a Victorian stable building to make a very modern home. With regular tours by the architect, this should make a fascinating visit. St Paul's Church, Deptford High Street, open Saturday 11-5 and Sunday 1-4.30. APT - the Art in Perpetuity Trust, 6 Creekside, open Saturday and Sunday 1-5. Lewisham Arthouse, 140 Lewisham Way, open Sunday 1-5. 2 Ashmead Mews, between 40 and 42 Ashmead Road, half-hourly tours on Saturday and Sunday, 1-5.30. Today was spent travelling from Brittany to London - here's one of my last pictures of France. 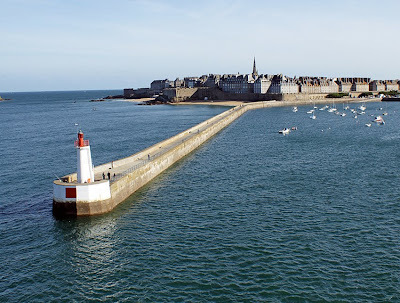 It shows the walled city of St Malo, home of pirates and corsairs, as seen from the ferry. And on a watery theme, don't forget that this weekend is the Thames Festival! 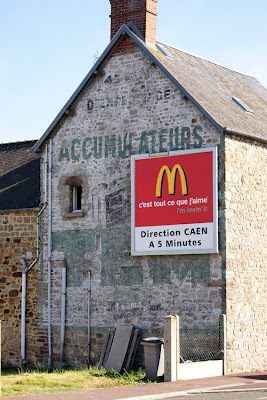 Driving from Cancale to Mont St Michel, I spotted three new ghost signs. 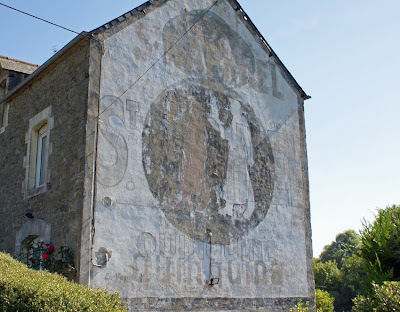 The first was on the way to Cancale and, tying in with my last post on these adverts, features the aperitif St Raphael. This time, its distinctive 'two waiters' logo is visible. They always appeared in contrasting colours, representing the two versions of the drink (regular and red). Careful examination shows that two separate adverts for the same product have been superimposed: the first had the logo at the top and the brand name writ large, while the second made a much more central feature of the image. The second sign is a fragment of an advert for Azur petrol - a cunning reminder to tourists motoring along the coastal road to Mont St Michel. Finally came a rather nice one, featuring a vintage piece of electronic equipment (accumulators are electrical storage cells). Pity about the McDonald's poster perched on top! The patchy writing at the top proclaims 45 years of experience; this sign should therefore date from around 1932 since TEM was founded in 1887. It manufactured lead accumulators for industrial and lighting use, although the range soon expanded to electrical transformers and batteries. It was a leading company, supplying the first French submarines, and even had a dedicated chapter in the 1904 publication Les Accumulateurs Electriques. 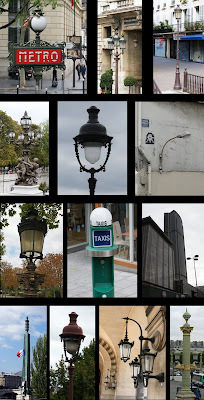 The company name stood for 'Travail Electrique des Metaux'. 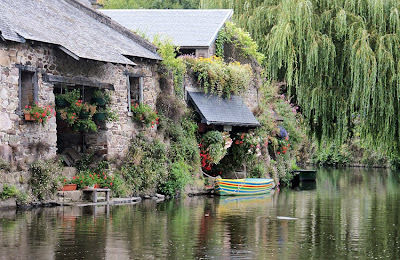 Centred on a house by the river Trieux in Brittany, the Seznec affair continues to make waves in the French justice system. It's a real murder mystery (so much so that it's not even agreed a murder was committed), one whose answer is still disputed. Guillaume Seznec (left) was master of a sawmill in the Breton town of Morlaix. Among his business associates was Pierre Quéméneur, wood merchant and a conseiller général (roughly equivalent to a county councillor). In May 1923, the two men took a business trip together, connected with the sale of American vehicles left in France after the First World War. That journey would end with the disappearance of Quéméneur and Seznec's eventual conviction for his murder. On 25 May, Quéméneur and Seznec left the Hotel de Paris in Rennes in a Cadillac. They were on their way to Paris. Quéméneur was expected back on 28 May, but according to Seznec, he was first meeting an American called Chardy or Sherdly about a major deal involving second-hand Cadillacs. Seznec claimed that because the car kept breaking down, he'd left his colleague at a station where he was to take the train to Paris, while Seznec himself returned to Morlaix. However, Quéméneur was never seen again. On 13 June, a telegram signed Quéméneur arrived from Le Havre, claiming he wouldn't be back for another few days. The next news came a week later, when a railway employee found his suitcase in the third-class waiting room. Among its contents was a typed sales contract for the manor house Traou Nez (right) to be sold by Quéméneur to Seznec - suspicious both because it was typed, unusual at the time, and because the price was a ridiculously low 35,000 francs. Seznec had an explanation. He said that he had already paid over $4,000 which Quéméneur needed for the Cadillac sales deal; the francs were merely the outstanding balance. Quéméneur had typed the contract himself. Unfortunately, this account was contradicted by witnesses who claimed to have seen the two men together on their way to Paris beyond Dreux station. As for the telegram and suitcase in Le Havre, Seznec was seen in the town on the day in question. He had just bought the typewriter used for the contract, using a false name, and forged Quéméneur's writing on the document. Experts also agreed that the teleraph form was in his writing. There was one big problem with the case, though: Quéméneur's body had not been found. Had he therefore met with some other fate, been murdered in Traou Nez by a third party, or even left the country for America? There have also been allegations of police misconduct as well as conflicting witness evidence. Seznec's trial began in late October and lasted eight days, with 124 witnesses. 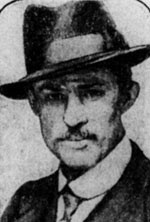 On 4 November, he was convicted of murder. The jury did not agree that this was a pre-meditated trap, and he was sentenced to life imprisonment with hard labour. He was taken to a prison in French Guyana to serve his sentence. However, the story did not end there. Seznec and his family always protested his innocence. He was released early, in 1947, but died in 1954 as a result of a supsicious hit-and-run accident in 1953. This final incident only reinforced doubts about his conviction; the last appeal against it was as recent as 2006. This was rejected on the basis that there was no new evidence casting doubt on Seznec's guilt. The matter therefore rests, but the questions have not gone away. Meanwhile Traou Nez, the manor house at the centre of the affair, is now a stopping-point on the Paimpol-Pontrieux steam railway. 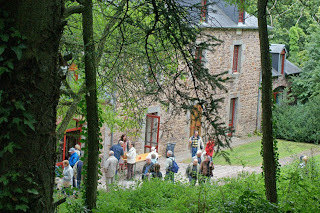 There I discovered this murder mystery - somewhat incongruously while enjoying cider, crepes and rural peace. Further reading (in French): the appeal judgement. 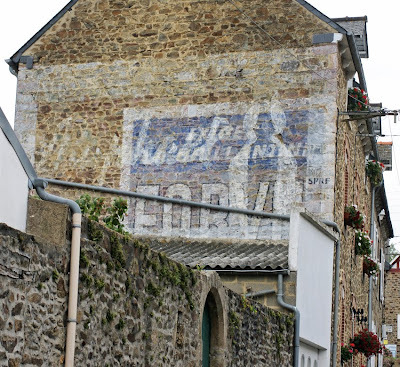 My latest ghost sign finds are two Breton palimpsests featuring popular French aperitifs. First, in Jugon Les Lacs, there's a spelling error in 'Dubonnet' (the same mistake is found in nearby Broons: perhaps it was the same signwriter). 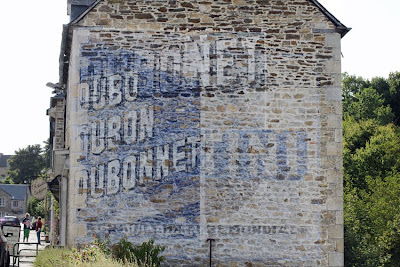 The second attempt painted over it is not only correct, but also features the famous Dubo-Dubon-Dubonnet slogan. Like many other aperitif drinks, Dubonnet contains quinine. Apparently this was the result of a call by the French government to find an appetising way for soldiers in North Africa to take the bitter but anti-malarial substance. Dubonnet's solution was to add herbs, spices and citrus peel. However, lurking more faintly behind the Dubonnet adverts is the Martini logo. Although very popular in France, Martini is of course an Italian brand. The second palimpsest, in Lamballe, has St Raphaël emblazoned faintly across it, and the bottle's silhouette can just be made out. Company legend has it that the drink got its name because when inventor Dr Juppet's long nights working on the formula caused his sight to fail, he prayed to the archangel Raphael (who had cured Tobias of a similar infliction). Juppet's sight was restored, his formula was a success, and he named the drink in tribute. The distinctive font dates back to the 1930s; the bottle itself is as important a part of St Raphaël's image as the label. Both features survive on this advert; the drink itself is yet another quinine-based aperitif. Its bitterness is ameliorated by ingredients including orange peel, cocoa and vanilla. More legible is the exhortation to 'exigez la brillantine Forvil': demand Forvil brilliantine. This text-only advert was typical for the brand. Like the British favourite, Brylcreem, Forvil enjoyed great popularity in the 1950s. It gave the hair shine and a pleasant scent. 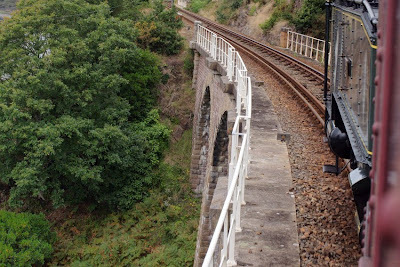 The Vapeur du Trieux steam train runs from the seaside town of Paimpol along the Trieux river to Pontrieux. 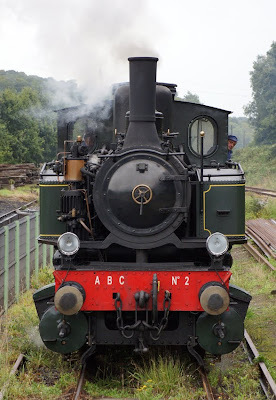 The locomotive, a Mallet, was built in 1911; its restoration was completed in 2005. 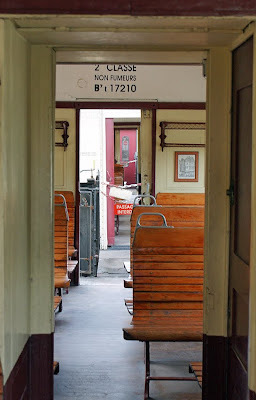 It now pulls six carriages: some first class, with upholstered seats, from the 1950s and two rather more basic second-class ones from the 1920s. 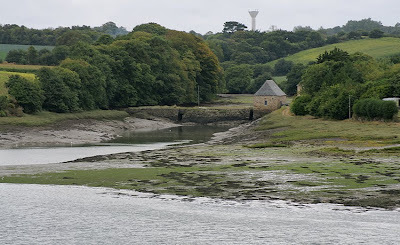 The train meanders at just under 20mph past river scenery, including the Chateau de la Roche Jagu and the house at the centre of the Seznec Affair (subject of a forthcoming post). The journey terminates at Pontrieux, a small but attractive town famous for its lavoirs - private washing facilities on the riverside.